Like everyone, I use filters. Oh how we adore them. We filter our lives through Facebook, Twitter, and Instagram. It’s fantastic – it’s like Sephora, except not just for the female visage – it’s for everyone’s cyber avatar (which could arguably be a disturbingly independent, distinct identity from its owner). But filtering is more than selectively publishing life statuses and photographs. Filters obscure, and make mild of perception. They deceive and dismiss the reality, the rawness of things. Do you agree, that the heart is felt with more reality, above all else? Do you agree, that the heart is beautiful? But we filter the living breath out of it. I’m far from perfect – I’m me, and I know better than anyone that I am despicable – but I try. I try to be the person I want to become, and stop trying to become the person I want to be, else I’ll always wallow in self-loathing and self-pity because I will always be a step behind. And keep hashtagging edited photographs with #nofilter. You wanted real, didn’t you? Also, raw is beautiful, just look at this beauty of a feast. This is honestly the best fish I ever had, and what’s even better is that it’s part of my 7-Ingredient series. I originally wanted to bake it en papillote, but the four-pound beauty has outgrown the paramenters of my parchment paper by an unsalvageable margin. What I ended up doing was even simpler. Basically, from what you see above, I just covered that whole thing with aluminum foil, pinched down the sides tightly, and put it in the oven at a really low temperature. The result was phenomenal – the flesh was incredibly buttery and tender. And because I love all parts of fish, I ate the skin too, which was also extremely rich and creamy. That’s not all, the few roasted, sweet lemon slices basically worked magic and managed to permeate the entire fish with their vibrant perfume. 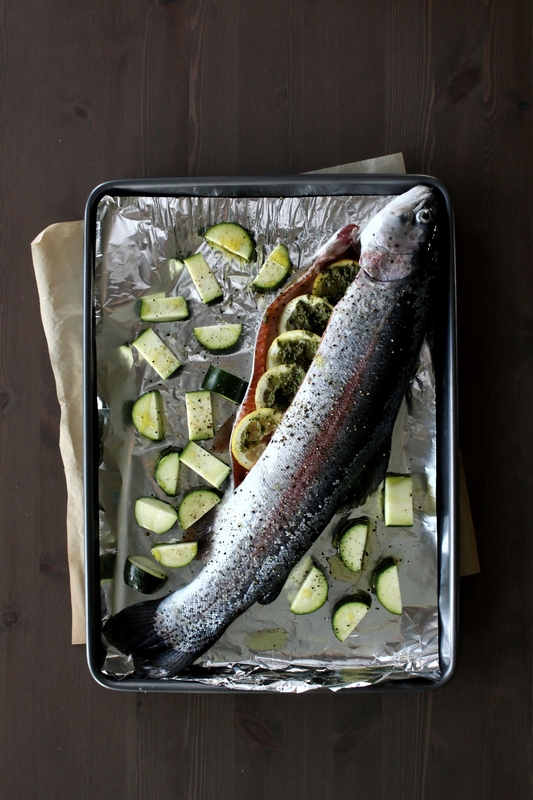 To make the slow-baked trout, preheat the oven to 300 degrees F, with the rack placed in the center. Cover the bottom of a large roasting pan with aluminum foil. Drizzle it all over with 1 tbsp of the olive oil. Meanwhile, prepare the fish. Trout have a slimy protective coating that also happens to be the source of its “fishy” taste. To remove this slime, rub the skin of the trout generously with 2 tbsp of the salt – that’s right, massage it with lots of love. Leave it for 2 minutes and rinse off the trout under cold, running water. Pat as dry as possible with paper towel, and repeat the process again with the remaining salt. Place the cleaned, dry trout into the prepared pan. Smear the pesto onto each of the lemon slices and fit them snugly, overlapping slightly, into the abdominal cavity. Add the zucchini to the pan and season everything with black pepper and a little more salt. Cover the pan tightly with aluminum foil. Bake for 20 minutes, turn off the oven, and let it sit in the hot oven for another 45 minutes, up to an hour. Serve with boiled new potatoes and/or a light green salad.